As Vice President of Operations, Mary manages Mestel’s national team of legal recruiters and researchers as well as oversees its operations. Additionally, she works with CEO Joan Davison to plan, develop, and execute the company’s growth strategy and vision. Mary also provides legal recruiting services to Mestel’s law firm and corporate clients in the New England market. 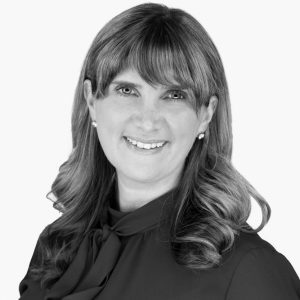 As an experienced recruiter, Mary has a strong record of placing attorneys and groups, with top-tier law firms as well as with corporations throughout New England. She is driven by helping her clients grow through personalized mutual fit. She connects well with her candidates and clients, understands what motivates them, identifies what makes them unique in the market, and then finds growth opportunities on their behalf. Mary joined Mestel & Company in 2008. Previously, Mary practiced law as a civil litigation attorney at one of Boston’s premier regional firms. Mary earned her J.D. from Boston University School of Law and B.A. from Colby College. She is a Massachusetts native, is a resident of the South End with her husband, and is a regular on Nantucket. Mary enjoys dining out in Boston and taking walks with Rocco, her Jack Russell terrier.